That book, the one being published next year. Here’s the catch-up. The publisher is Ford Street Publishing. Yeah, I know I can give you a link, but you can google it just as easily. We are setting up for a June 2009 release. That’s all, folks. Nothing to see here. Move along, please. This or That? Decisions. They come in all shapes and sizes. So I’ve faced a decision recently. This is the new toy. I bought it about the time of the last post. 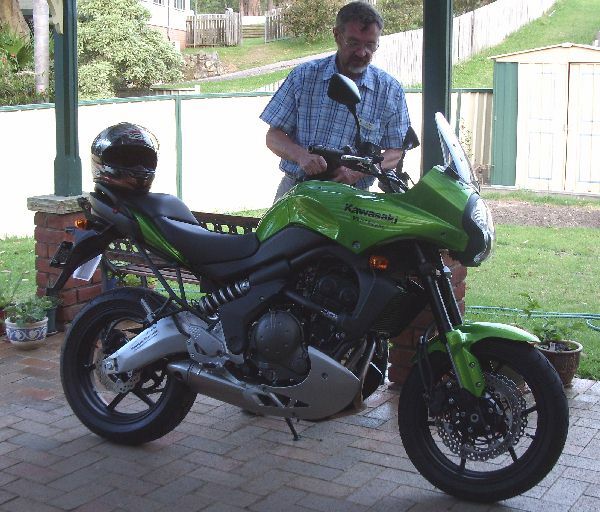 I can blog or I can ride. What would you choose? That party with the noise? It’s over. And the noise? Nothin’ to worry about. Bit of music, bit of talk, bit of car doors slamming about 2am. But the wine? That was wonderful. Sometimes you get the better end of the deal. This was one of those times. It’s almost 9pm Friday local time. Twelve hours ago I drove out to work. My neighbour was talking to the driver of a truck that had just pulled up outside his house. In the truck? The noise. It was the local juke-box and karaoke hire. I thanked the neighbour for the wine. “Tell your mate he’s got great taste in reds,” I said. The kids played around on the karaoke a bit this afternoon. Twenty four hours and it’s on in earnest. And me? I’ll be sitting somewhere quiet, perhaps down near the lake, drinking some very nice red. My neighbour dropped by to tell me of a party. A noisy party, and he was apologising ahead of time. A few days later the neighbour dropped by again. This time with two bottles. The party is a week away, but he wanted to check that the wine was suitable. There was a 1997 Grant Burge ‘Filsell’ Shiraz and a 2001 Leeuwin Estate ‘Art Series’ Cabernet Sauvignon. Ten minutes later he returned with another of the Grant Burge. “Forgot this one,” he said. “Let me know what you think and if they’re OK I’ll get you some more for the weekend,” he said. I could post the google links for these two reds, but you can do that for yourself. And if you do you will find online wine stores still selling both of them. The prices are considerable. Very considerable. We drank one last night, and the others will find their way to the same destination very soon. My beer-drinking neighbour and his wine-loving mate have excelled themselves in neighourliness. And it’s all left me wondering, just how much noise are they planning on making next weekend? 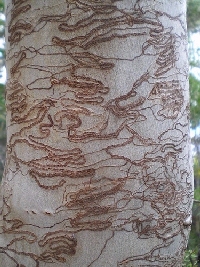 The scribbly gum is a tree with scribbles. A moth lays its eggs under the bark of a gum tree. The eggs hatch and the larvae crawl around eating into the layer under the bark. The tree sheds its bark and the scribbles come to the surface. Magic.